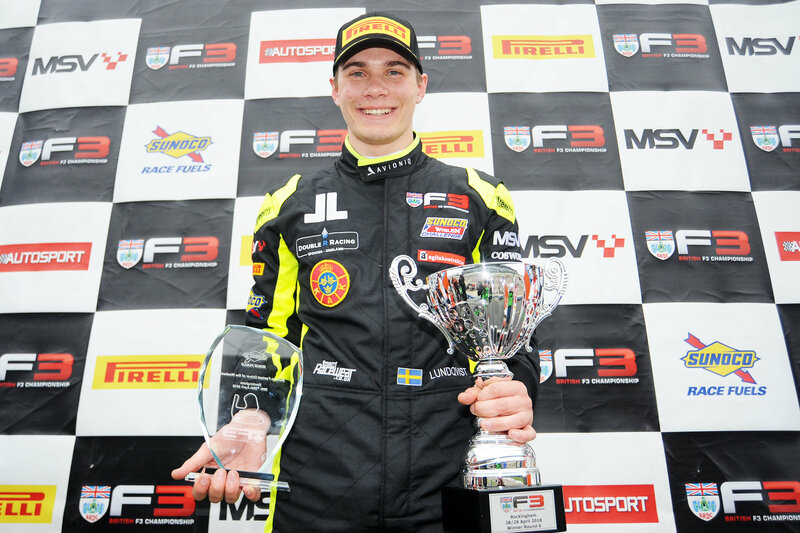 Double R Racing’s Linus Lundqvist is the new BRDC British F3 championship leader, after a Sunday full of silverware for the Swede. Lundqvist finished third in the reverse grid race two earlier this morning, which fired him to the top of the standings, which he then extended with victory in race three, successfully holding off a determined Nicolai Kjaergaard, who made amends for a difficult Saturday with two second places today. Kush Maini meanwhile announced himself as a championship contender, with his first ever car race win in race two this morning. This weekend’s results mean there have been five different race winners from the six races held so far, with Lundqvist the only driver to have won twice in 2018. Lanan Racing’s Maini came from fifth on the grid to take victory in a thrilling race two, and made it five different race winners from the first five races of the year. Carlin’s Kjaergaard surged from 13th to claim second ahead of Lundqvist, who secured third with a last lap move having started 10th, and with his second podium of the weekend, moved into a narrow championship lead. Jamie Chadwick finished fourth on the road, but was handed a five second time penalty for exceeding track limits and dropped to 10th, promoting Krish Mahadik, race one winner Tom Gamble and Manuel Maldonado to the top-six. Billy Monger, Jordan Cane, Clement Novalak and Chadwick completed the top-10. Sasakorn Chaimongkol started the race from pole, and made a decent start to lead the majority of the first lap from his fellow front row starter Chia Wing Hoong. However it was a tightly packed field behind, and Maini had already worked his way up to third half way around the first lap from fifth on the grid. He picked off Chia and then claimed the lead at Tarzan, stretching a gap of almost a second from Chaimongkol at the end of the first lap. Starting from 13th on the grid after his first lap retirement yesterday, Kjaergaard was already impressing and was up to fifth at the end of the first tour. While Maini stretched a lead of almost three seconds at the front, it was the Danish driver who was also catching the eye, moving into second by the end of lap two, and passing Chadwick, Chia and Chaimongkol, who dropped to 11th. Maini though was pumping in fastest lap after fastest lap, and constantly stretching his lead at the front, his fastest laps being enough to secure him pole for race three. The Indian driver claimed the win by almost five seconds from Kjaergaard, but behind them, the race was anything but decided. Chia held his own towards the front for a handful of laps, but eventually drifted back to finish 14th, one place ahead of pole man Chaimongkol. As the faster drivers climbed through from the back, it was Chadwick who looked on course to claim third though she was holding a queue of drivers behind, which included Lundqvist, who started 10th, Mahadik who started eighth, Gamble who started 11th and Monger, who fought up from 12th. Lundqvist tried on several occasions to force a move, notably on the approach to the Deene hairpin on lap 11, though he finally forced his way onto the podium by going around the outside of the hairpin on the last lap to claim the inside line for Yentwood. By this point though, Chadwick had picked up a five second penalty, and with the chasing pack so close behind her, plummeted down the order as the classification was settled at the flag. Mahadik in fourth held off Tom Gamble by just 0.309s, with Monger just 0.240s further back, though Monger was given a three second penalty post-race after an incident with Maldonado. Cane meanwhile was pushed down the order a little in the opening stages, but battled away to claim eighth, 0.798s behind Maldonado, who started seventh and finished seventh on the road, but was elevated to sixth after Monger’s penalty. Novalak backed up his overtaking abilities demonstrated at Oulton Park by finishing inside the top-10 here, having started 15th, and classified 0.102s ahead of Chadwick. 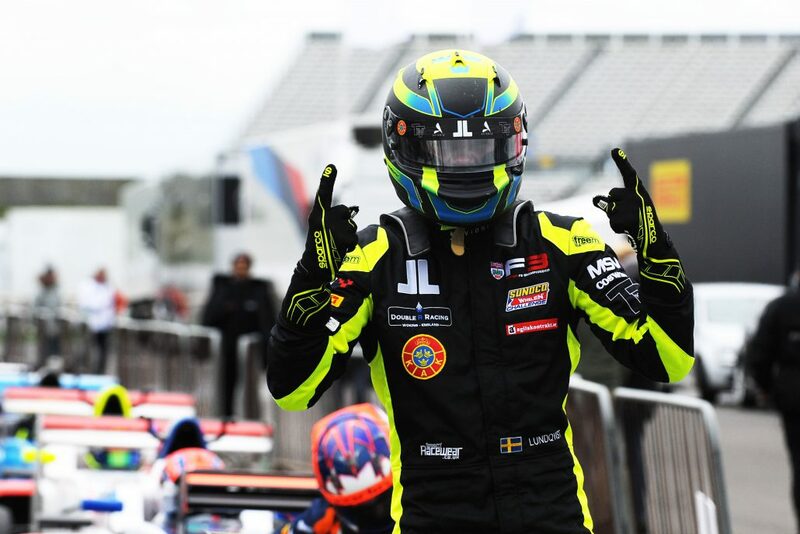 Championship leader Lundqvist extended his advantage at the top of the standings with an exciting and hard fought win in the final BRDC British F3 Championship race of the day at Rockingham. Manuel Maldonado was fourth, with Jordan Cane fifth and Krish Mahadik sixth. Sun Yue Yang claimed seventh ahead of Sasakorn Chaimongkol, with newcomer Josh Mason ninth and Ben Hurst completing the top-10. Once more, there was drama on the first lap as Arvin Esmaeili hit trouble at Deene, with team mate Jamie Chadwick stranded at Chapman and Pavan Ravishankar also failing to complete the first lap. Post-race Chia Wing Hoong was disqualified from the results for causing Esmaeili’s retirement, while Clement Novalak, who had finished seventh, was disqualified for contact with Chadwick. Amongst this drama was the added spice of Lundqvist and Kjaergaard almost wheel to wheel around several corners, before the safety car was deployed to recover the three stranded cars, with Lundqvist just holding off Kjaergaard, with Maini, Monger and Gamble the early top-five. The safety car pitted at the end of lap two, with Lundqvist and Kjaergaard resuming their duel. Just behind, a good restart from Monger put him into the slipstream of Maini and the Brit tried a move at Deene, only to be pushed wide on the exit and dropped down to sixth. Lundqvist established a lead of almost nine tenths from Kjaergaard, with Gamble and Mahadik profiting from Monger’s scrap with Maini to jump into fourth and fifth. Monger wasn’t down and out though, and immediately repassed Mahadik for fifth. Lundqvist’s lead was trimmed to 0.6s by the end of lap five, with Kjaergaard charging him down, the pair lapping at almost identical speeds. Further back, an excellent scrap developed between Maldonado, Mahadik, Novalak, Cane, Sun Yue Yang and Owega, with the six drivers operating almost as one. The scrap was brought to a close though when Owega challenged Mahadik at Tarzan on lap eight, lost traction and hit the barrier, bringing out the safety car for the second time. The safety car pitted at the end of lap 11, leaving three laps for Kjaergaard to find a way past for the lead. He challenged for the first time at Deene, but Lundqvist held him off, while Monger was challenging Gamble, passing him for fourth at Tarzan, only for Gamble to fight back and retake the position. Lundqvist and Kjaergaard went side by side at Deene once more on lap 13, with Lundqvist just keeping his lead, and bringing Maini into the lead scrap too. Meanwhile Monger was again challenging Gamble at Deene, the Carlin driver opted for the outside line and the pair made contact, forcing Monger out of the race with just over a lap remaining. Gamble was disqualified post-race for his part in the incident. With yellow flags flying at a prime overtaking position, Lundqvist was able to keep his cool on the final lap to secure his second victory of the year, and his third podium of the weekend, taking the flag less than three tenths clear of Kjaergaard, and Maini just behind. In the championship standings, Lundqvist holds an 11 point lead over Kjaergaard, with race one winner Gamble third and 26 points further back. Race two winner Maini is fourth, six points behind Gamble, with Maldonado and Mahadik completing the top six. 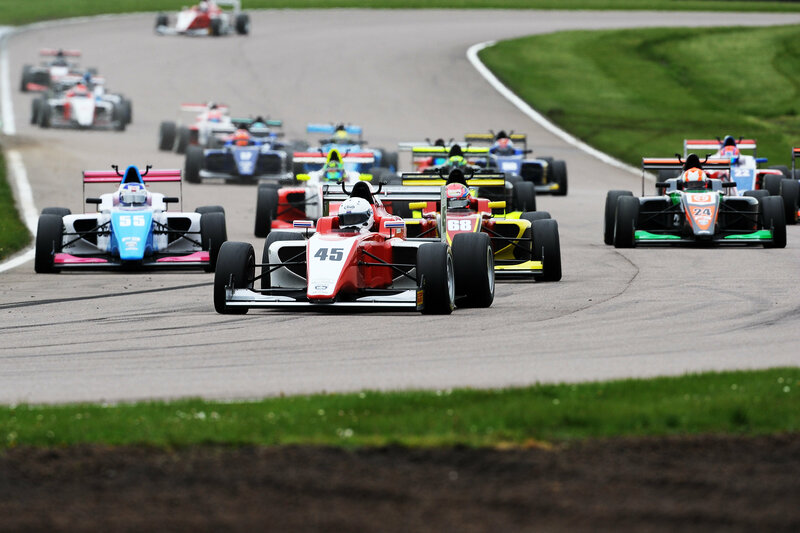 The next rounds of the BRDC British F3 Championship take place at Snetterton on 26-27 May. For more championship information visit www.britishf3.com.